Bolaji Abdullahi, a former National Publicity Secretary of the All Progressives Congress (APC) has announced his resignation from President Muhammadu Buhari’s appointment. The former minister confirmed this on his Twitter page on Friday. 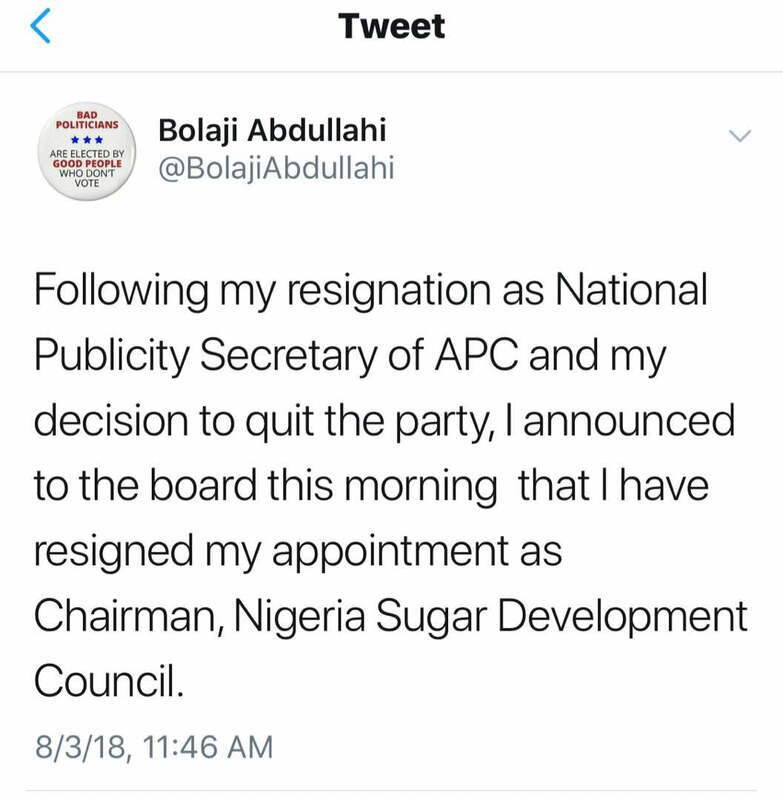 Bolaji Abdullahi officially quit the ruling party on Wednesday. A statement he signed read: “In view of recent political developments in the country and within the All Progressives Congress (APC), I have decided to resign my position as the National Publicity Secretary as well as my membership of the party with effect from today. “I have served the APC honestly and to the best of my ability and when I stood for and won my election at the last convention, it was a keen desire to continue to do so. However, in a situation whereby my loyalty is constantly brought into question; my subordinates deployed to subvert my office; and my views constantly second-guessed on the basis of my political affiliation, it has become imperative for me to review my position. “Quite recently, we all took the oath to do justice to all and not allow personal interests to interfere with our official responsibilities. “With this obviously presumptuous action, and the decision to appoint as chairman of caretaker committee, the same man who had emerged as the chairman from the parallel congress in my State, the NWC has taken sides, violated its oath office and subverted its own credibility as an impartial arbiter. Yet, these are the same people that have continued to insinuate that others are serving interests other than those of the party. “Politics is local, and my personal stake in the issue of Kwara makes it incongruous for me to continue to sit as part of the working committee of the party. Clearly, I cannot continue to function as the spokesman of a party whose expectations of that role is incompatible with my personal principles. “In the same token, I can no longer justify to myself that I should remain in a party which has now made it clear to the world that the political group that I belong is no longer wanted, and which has hung my membership of that group as an albatross around my neck.